As a breeder who uses the services of the world's largest registry of pedigreed cats. I understand I have certain responsibilities to pedigreed cats and to the Cat Fanciers' Association (CFA). I am aware that I am representative of CFA breeders in my community. I will breed my cats with the intent of improving the breed and to produce healthy, happy kittens. I will deal honestly with the purchasers of my kittens and cats. To the best of my knowledge and ability I will not, without prior disclosure, sell any kitten/cat that is sick or has been exposed to an infectious disease. I will not sell or place kittens prior to their attaining a proper level of immunity against common infectious diseases. I will strive to house my cats in a manner exceeding the CFA Minimum Cattery Standard. I will ensure my cats are kept in a healthy environment and I will ensure they receive the proper veterinary care as needed. I will maintain appropriate cattery records and will correctly register litters and cats. I will work honestly with my fellow breeders and provide timely and correct litter registration information to those who use my cats for breeding. I will mentor new breeders to ensure they have a solid information foundation. 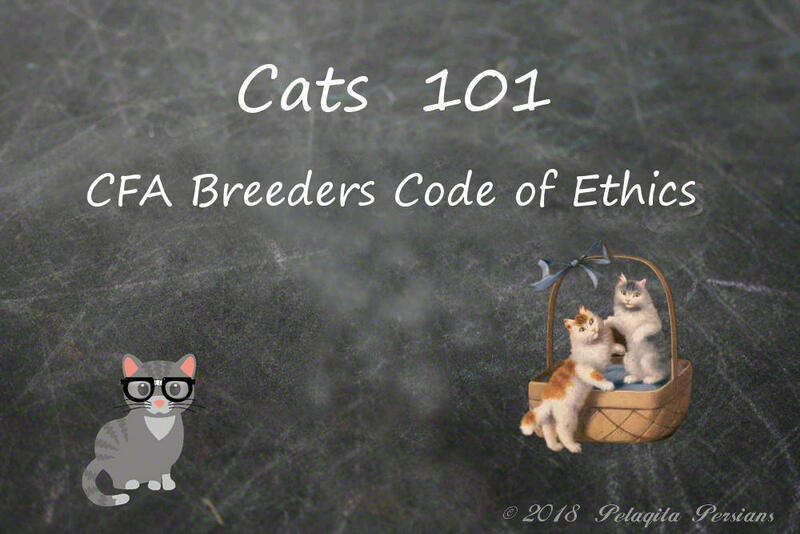 * This means that a breeder does NOT sell a kitten or cat to a third party seller (i.e., breeders who raise kittens or puppies and then sell them to pet stores, through EBAY, etc. When a breeder does this, they have no idea who the final owner of the kitten or cat is).